13 complaints on poll related violence including group clashes, firing, EVM breakage, etc have been received at different police stations across the State. Confirming the incident, Inspector General of Police (IGP) and State Nodal Officer (Election) Sunil Garg today informed that the man was rushed to a hospital where he succumbed to his injuries. The IGP also revealed that so far, 13 complaints on poll related violence including group clashes, firing, EVM breakage, etc have been received at different police stations across the State, with some of the cases registered and few under investigation. The districts that witnessed electoral clashes are – Kurung Kumey, Kra Daadi, Longding and East Kameng, Garg said while adding that the overall law and order situation is now under control. In Pipsorang under Kra Daadi district, three persons were injured badly in a group clash between the supporters of two political parties. 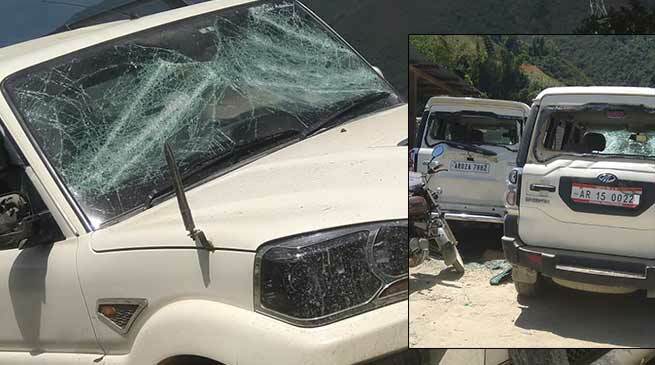 The seriously injured were then evacuated to Itanagar hospital for medical treatment through a helicopter, Additional CEO Kanki Darang had said. Report of complain of booth capturing, ballot box breaking and other poll related violence from Kurung Kumey, Kra Daadi, East Kameng, Pakke Kessang have come in. The NPP candidate of 21 Koloriang, INC candidate of 19 Nyapin and INC candidate of 12 Pakke Kessang have submitted complaint to presiding officer, Returning officer, District election officer respectively. Confirming the poll related violence in Kurung Kumey district, Deputy commissioner Santosh Kumar Rai inform over telephone that there was a incident of arson in Sangram where resident of OC Sangram was burned down while few vehicle have also been damaged, but extent of damages is yet to confirm. A case have been registered at Sangram Police Station and investigation have been launched. DC added.